This is a lovely set of designs which are intricately hand drawn – one might even say minutely drawn in some instances. This is a book I suggest for individuals with good eyesight and a steady hand. If you have vision issues or issues with fine motor skills, this may not be the book for you. You will need some extra fine point coloring medium to complete some of the pictures but they are really beautiful and well worth the effort. There are land animals, birds, and fish. I really love the bee designs and will enjoy coloring those even though when I see a bee in real life, I make for the hills. This is my second book by Samantha Snyder of Doodle Art Alley Books. I’m having a blast with her books. The designs are all fun to color and can be done in an evening. The designs are all hand-drawn which adds to the enjoyment. I find that hand-drawn designs make the project more fun because the end result is always pleasing to my eye. I don’t see where I goofed on a line quite so easily because the design isn’t the precise lines of a computer generated design. A lot of geometric designs fall into the computer generated area. Nothing against those, I have them and enjoy them, too. It’s just that this book is a more unique set of designs. As with my prior book, these are great projects for beginners or anyone with vision and/or fine motor skills issues. 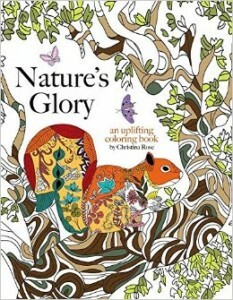 This is an really pretty coloring book of fairy tale designs. There are 78 pages of designs with most of them spanning across two pages. The designs are intricately drawn and will require a steady hand and good eyesight to color. The fairy tales included are: Little Red Riding Hood, Hansel and Gretel, Snow White and the Seven Dwarfs, Sleeping Beauty, Rapunzel, Swan Lake, Twelve Dancing Princesses, Cinderella, The Magic Horse, The Mermaid, the Snow Queen, and The Nutcracker. Many of the words are in English (introduction to the designs) along with Japanese. The explanation pages at the beginning and end of the book are in Japanese only. 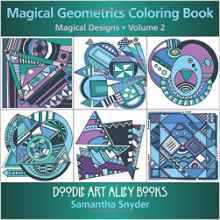 This is my second book of coloring designs by this talented artist. My first book is one of a variety of animals, including horses. In this coloring book, horses are the main theme (there are two Pegasus designs, one zebra, and one of a horse with a Native American.) Apart from those, every design is of one or more horses. The horses are beautifully and realistically drawn in the line drawing form and then the artist adds other elements and “doodles” with the horse to give the colorist the ability to have more fun when coloring the designs. The designs are fun, easy to color, and have a nice level of detail without having small and minute areas to color. 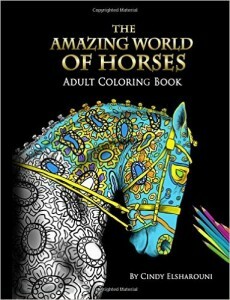 There are 42 coloring designs (45 if you include the horses on the intro pages to the book.) A number of the designs have gray scale shading already added to them, which makes shading easy as the base color (usually in marker for me) takes on a darker hue when put over the gray. This is coloring book is part of a new line by The Coloring Studio that supposed to be for the entire family. While the designs are funny and imaginative, they have more detail to them than most younger children can color. They certainly require something more than crayons to work with as well as fine motor skills that most children lack. The subject matter spans the age of a family but the artwork is geared towards older children and adults. The designs are fanciful and would ordinarily be a lot of fun to color. I note below that there are issues with the binding and printing but those I can and have accepted with others books. The real issue with this book (and the others in the same line) is that the artist/publisher have colored in way too much of the designs. It is one thing to have the background colored but to have major portions of the designs colored was not the best decision. It is next to impossible to match the colors used and, in this book at least, the color palette used is the same in each and every design and are certainly not the colors I would have chosen. By coloring the elements as they have done, it doesn’t allow for much creativity for the colorist of any age to work with. I have colors that are similar but in the end, they are in markers that don’t work well with the double sided printing in this book. This slightly oversized coloring book is printed on both sides of the non-perforated page. All of the designs have unfinished elements at all sides of the page. Seven of the sixteen designs spread across two pages and portions of the designs are lost due to this. The remainder of the designs all merge into the binding. The binding is a hybrid of sewn and glued. It is next to impossible to get this book to lay flat. I broke the spine to get one set flat but then was unable to do so for any other pages without tearing at the binding. All alcohol-based markers bleed through this paper rapidly. While fine point water-based markers also bleed through, ultra-fine points (such as Stabilo 88 and Staedler triplus fineliners) and Tombow dual end brush tip, do not (note that the fine point of the Tombow does bleed through.) My gel pens (all brands and point sizes) worked well with the paper. My coloring pencils worked great as well and produced the results expected for the type of pencil lead used. My soft lead pencils were easy to lay down color and blend especially well. I will list, in the comments section of this review, the coloring mediums I used in testing this book. 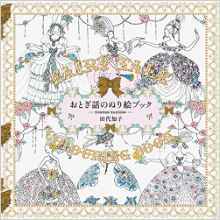 This is a coloring book of 24 fairy designs. The span from child-like to more adult figures and have a nice level of detail but not what I would call intricate. These are designs to have fun with and either color as is or try out some blending skills. The cover art is not a single design in the book but rather three separate designs of one each of the fairies. The designs are printed on one side of thin white non-perforated paper that is typical for books published by CreateSpace. Some of the designs merge into the binding. The binding is glued rather than sewn and you will lose some portions of some designs if you remove them from the book. I found that the book is easy to lay flat if you are willing to slightly break the spine. That is how I will use the book rather than cut out pages. All of my markers bleed through and my gel pens either bleed through or leave a distinct shadow on the back of the page. My India ink pen fared the best but still left a slight shadow at the back of the page. My coloring pencils work well with the paper and behave as I expect depending on whether they are hard or soft lead. I will use a piece of chipboard or heavy paper behind the page I am working on so I don’t ruin the following page with leaking ink. In the comments section below, I will provide a list of the coloring mediums I used for testing this book. This is a cute coloring book of cat designs, especially the first few pages which show a short hair cat venturing on his vacation to Paris. The beautiful design that is on the cover of this book is definitely included inside. Every page has something fun to color even the ones that I would categorize as wall-paper make me want to reach for my pens and pencils and get started. After the first few pages, the book evolves into a very well done book of cats in various poses and situations. I know many of the situations all too well from my years of having cats as pets. I like that there are both intricately drawn cats as well as what amounts to line drawings of cats. The former gives me a challenge in coloring in small spaces and the latter gives me opportunities to test my blending skills to create what I want of the cat. My one major issue with the book is that it is supposed to be about cats in Paris and there are only a few pictures that can be categorized as such. The book has a removable dust cover. Both the inside of the dustcover and the actual attached cover have some fun coloring opportunities. The designs in the book are printed on both sides of the great heavyweight non-perforated paper. Designs run into the binding and many of the designs spread across two pages. In my copy, the pages line up very well. The binding is a hybrid of sewn and glued actually the binding I dislike most of all impossible to snip the threads but so many that when you push the book down hard, the threads seems to pull at the page. You simply have to cut the pages if you want to remove them and given the layout of the designs, you will lose portions of them if you take them out of the book. I am able to get the lay flat and will color the pages in the book because of the extent of coloring medium I can use. My alcohol-based markers were the only coloring medium that bled through the page. All makes, sizes, and brands. My water-based markers of all types and sizes, my India ink artist pens, and my gel pens did not leak through or leave any shadows. The gel pens did not need extra drying time. I did notice that both the smallest nib gel pens and my hard pencils could leave an indent if I was a bit heavy-handed in my coloring something to think about when you go to color in this book. My coloring pencils worked fantastic, especially the soft lead that went on thick and creamy and blended well. My decision is to not use alcohol-based markers with this book. There are so many other choices, I don’t need to. If you do use them, be aware that the ink will leak through and not only ruin the back of the page but could leak through further into the book. In the comments area below, I will provide a list of the coloring medium I used in testing this book. Escape to Wonderland is the second coloring book I have by Good Wives and Warriors (artists Becky Bolton and Louise Chappell.) It is a smaller format book (at approximately 7.5 x 7.25 inches) but is packed with lots of fantastic deisgns. If you include the title page, there are a whopping 96 pages of designs in this book. The book tells the excerpted story (both in written and design form) of Alice in Wonderland. The characters are imagined in new ways which makes it so much fun to color. I have a more traditional version of Alice and I know I will like this new coloring book just as much as my other one. Some of the designs have intricate and small details that may prove challenging for some individuals. The designs are printed on both sides of heavyweight cream colored non-perforated paper. Twenty-six of the designs spread across two pages. In my book, these two page designs line up very well and if I press the book flat, I don’t have any lose of design into the binding. The attached cover of the book is well made and has gold foil, two shades of blue touches. You can color the remainder of the cover (front and back) if you wish. The inside of the cover has fold-outs (front and back) and a white on blue line print which you can also color. The rest of the pages are designs, so you can literally color this book on every page, if you choose to do so. A few of the pages have words on them and those are generally incorporated into the design. A couple of them are primarily the words with a small amount of coloring designs on the page. The binding is sewn rather than glued, so removing pages will require a few snips of threads every few pages. I won’t be taking mine apart as I think it is a lovely little book that tells a story that I want to keep together. This series is one of the prettiest of the small coloring books I have in my collection. They are extremely portable and fit in my purse well. I hope to see more coloring books by these talented artists in the future. The Scarecrow of Oz, The Road to Oz, Jack Pumpkinhead and the Sawhorse, The Littlest Giant An Oz Story, A Magnetic Personality, Tik-Tok of Oz, The Magic of Oz, The Wonderful Wizard of Oz, The Patchwork Girl of Oz, Glinda of Oz, The Wicked Witch of Oz, Ozma of Oz, The Woggle-Bug book, The Tin Woodman of Oz, The Marvelous Land of Oz, How Adventurers Lost and Found Themselves, Lucky Bucky in Oz, The Witchcraft of Mary-Marie, Rinkitink in Oz, The Purple Prince of Oz, and The Lost Princess of Oz. While these are not the traditional characters that most of us are used to, they are fun and interestingly drawn. I plan to color all of these and have them on hand when I read the books to my grandchildren. Each of the single page designs are printed on one side of the white perforated page. The page opposite gives an explanation of which book and quote from the book is represented by the design. The four page fold-out is also perforated on the side of the page closest to the binding. The binding is glued rather than sewn. All of the designs stop well before the perforations and have various types of framing lines around the edge of the design to give them a more finished and polished appearance. If you remove a page from this book at the perforations, you will not lose any portion of the design. All of my alcohol-based markers bled through the page immediately. All of my water-based markers, India ink pens, and gel pens did not leak through but they left a faint shadow of color on the backside of the page. My coloring pencils worked very well. The soft lead went down creamy and could be blended easily. The coloring medium I used for testing this book is listed at the bottom of this review. I plan to use chipboard or card stock as a blotter when I am coloring in this book to keep the rest of the book in pristine condition. This is a really easy and enjoyable coloring book of 50 mandala designs. The designs are all hand-drawn which adds to the enjoyment. I can be a little more free in how I color these designs as they are not computer-generated exact match quadrants of designs. If I want make a slight error I can generally mask it as part of my design plan. I also find that hand-drawn designs, such as these, really inspire me to try new ways of looking at mandalas. I suddenly realized that I wanted to color a gray scale into a design after studying one of these. I really enjoyed that process and experiment and will probably do more of it in the future. The book is a smaller format book which cuts dead space away form the circular design of the mandala. I appreciate that as it makes it easier for me to frame my finished project if I choose to do so and saves paper from being wasted. The designs are printed on one side of bright white non-perforated paper. The designs are centered well on the page and the print quality is excellent. The binding is glued rather than sewn, so you can cut pages out if you choose to do so. I was able to break the spine enough to get the book to lay fairly flat and it was easy to get to all parts of the design to color. Each of the designs has a framing line around them which is great if you are coloring a background for the mandala you get a natural stopping point instead of having to color to all edges of the page. All of my markers (water and alcohol-based, fine, ultra-fine, and brush end) bled through this paper. My India ink brush pen also bled through. My gel pens (all brands and nib sizes) all left a color shadow on the back of the page. My coloring pencils worked well for their lead type. The soft lead blended really well. The hard lead left indents at the page of the page if I pressed hard when coloring. All of these are non-issues for me because I place a piece of chipboard or card stock under the page I am working on and nothing mars the design on the following page. I will list, the comments section below, the coloring mediums I used in testing this book. I received a free sample of this coloring book for test and review purposes.